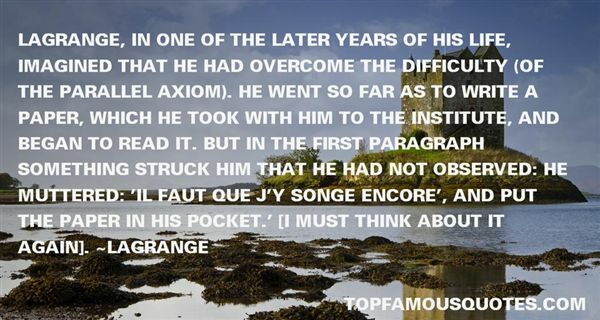 Reading and share top 9 famous quotes and sayings about Lagrange by famous authors and people. Browse top 9 famous quotes and sayings about Lagrange by most favorite authors. 1. "Accordingly, we find Euler and D'Alembert devoting their talent and their patience to the establishment of the laws of rotation of the solid bodies. Lagrange has incorporated his own analysis of the problem with his general treatment of mechanics, and since his time M. Poinsot has brought the subject under the power of a more searching analysis than that of the calculus, in which ideas take the place of symbols, and intelligent propositions supersede equations." 2. "It is a matter for considerable regret that Fermat, who cultivated the theory of numbers with so much success, did not leave us with the proofs of the theorems he discovered. In truth, Messrs Euler and Lagrange, who have not disdained this kind of research, have proved most of these theorems, and have even substituted extensive theories for the isolated propositions of Fermat. But there are several proofs which have resisted their efforts." 3. "There was yet another disadvantage attaching to the whole of Newton's physical inquiries, ... the want of an appropriate notation for expressing the conditions of a dynamical problem, and the general principles by which its solution must be obtained. By the labours of LaGrange, the motions of a disturbed planet are reduced with all their complication and variety to a purely mathematical question. It then ceases to be a physical problem; the disturbed and disturbing planet are alike vanished: the ideas of time and force are at an end; the very elements of the orbit have disappeared, or only exist as arbitrary characters in a mathematical formula." 4. "What is history? Any thoughts, Webster? ''History is the lies of the victors,' I replied, a little too quickly. 'Yes, I was rather afraid you'd say that. Well, as long as you remember that it is also the self-delusions of the defeated. ...'Finn? ''"History is that certainty produced at the point where the imperfections of memory meet the inadequacies of documentation." (quoting Patrick Lagrange)"
5. "The great masters of modern analysis are Lagrange, Laplace, and Gauss, who were contemporaries. It is interesting to note the marked contrast in their styles. 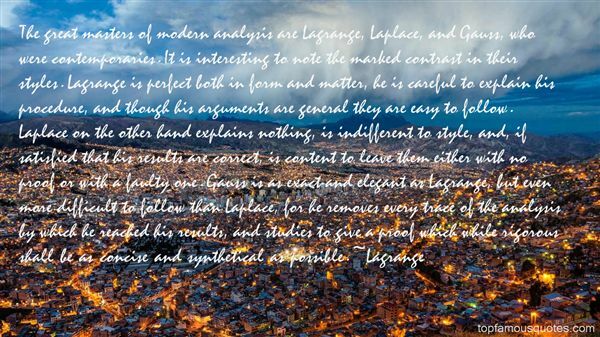 Lagrange is perfect both in form and matter, he is careful to explain his procedure, and though his arguments are general they are easy to follow. Laplace on the other hand explains nothing, is indifferent to style, and, if satisfied that his results are correct, is content to leave them either with no proof or with a faulty one. Gauss is as exact and elegant as Lagrange, but even more difficult to follow than Laplace, for he removes every trace of the analysis by which he reached his results, and studies to give a proof which while rigorous shall be as concise and synthetical as possible." 6. "Lagrange, in one of the later years of his life, imagined that he had overcome the difficulty (of the parallel axiom). He went so far as to write a paper, which he took with him to the Institute, and began to read it. But in the first paragraph something struck him that he had not observed: he muttered: 'Il faut que j'y songe encore', and put the paper in his pocket.' [I must think about it again]." 7. "When one day Lagrange took out of his pocket a paper which he read at the Académe, and which contained a demonstration of the famous Postulatum of Euclid, relative to the theory of parallels. This demonstration rested on an obvious paralogism, which appeared as such to everybody; and probably Lagrange also recognised it such during his lecture. For, when he had finished, he put the paper back in his pocket, and spoke no more of it. A moment of universal silence followed, and one passed immediately to other concerns." 8. "The genius of Laplace was a perfect sledge hammer in bursting purely mathematical obstacles; but, like that useful instrument, it gave neither finish nor beauty to the results. In truth, in truism if the reader please, Laplace was neither Lagrange nor Euler, as every student is made to feel. The second is power and symmetry, the third power and simplicity; the first is power without either symmetry or simplicity. But, nevertheless, Laplace never attempted investigation of a subject without leaving upon it the marks of difficulties conquered: sometimes clumsily, sometimes indirectly, always without minuteness of design or arrangement of detail; but still, his end is obtained and the difficulty is conquered." 9. 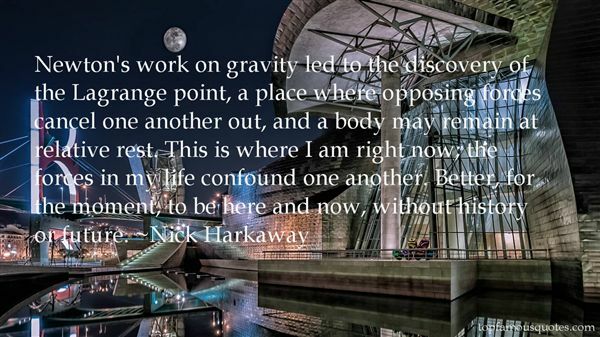 "Newton's work on gravity led to the discovery of the Lagrange point, a place where opposing forces cancel one another out, and a body may remain at relative rest. This is where I am right now; the forces in my life confound one another. Better, for the moment, to be here and now, without history or future." The ark was like a portable computer hard drive and Noah was a one-man Geek Squad, and he dumped God's most important files onto it before he zorched the virus-ridden computer that was the world."